Branded the ‘City of Discovery’, Dundee is uniquely placed to offer a mixture of culture for those who wish to discover it. The long established DC Thompson prints daily publications of The Courier and The Telegraph, as well as many specialised magazines for all ages. The Caird Hall is the centre of Dundee’s city centre, offering itself as a conference venue for political parties, jobs fares and live music as well as a place to voice political protest rallies. There have been many changes within Dundee due to the demise of traditional jobs and the rise of the service sector industry, but the Overgate shopping mall is one the best in Scotland and the rejuvenation of the city’s waterfront and docks is quite spectacular, with the famous Discovery ship taking pride of place. One constant has remained intact over recent years, this being the student population. The universities of Dundee and Abertay offer a diverse range of courses and career possibilities. The University of Dundee has a deep history and is well respected for its contributions to scientific discoveries over the years. The University of Abertay Dundee is the more modern of the two and is quickly establishing itself as a pioneer of modern technology, developing computer games in its White Space department. While the main student accommodation centres are in a prime location for shopping, socialising and (most importantly for some) the nightlife, should you fancy seeing how the other half live. Each University has its own student union offering reduced rate alcohol and a lively environment to meet new people from all over the world. There’s no denying it – the Granite City is a rather dull, bleak place at times. But come dusk or dawn, the city is alight. Or rather, the sparkling deposits of the granite which dominates the city’s architecture are. The result is breath-taking. The city itself is actually rather lovely, past the amount of grey. The Victorian architecture is, as you would expect, very grand, but also very durable. And suddenly, the use of so much granite makes sense. But despite the sprawling size of the city, there isn’t the sense of claustrophobia found in other places – this is due to Aberdeen's 45 parks and gardens. It’s no wonder the city has won Britain in Bloom 10 times since 1965 – despite being barred from entering for a decade, in an effort to give other cities a chance. Away from the aesthetics, Aberdeen is known for its celebration of culture. This might be a surprise. For many foreign bands, Aberdeen is simply a peace offering to fans who complain about an excess of Glasgow dates. However, the local music scene is thriving. Film and the performing arts also play a big part here. If football is your pastime of choice, you may be disappointed here. But there are plenty of other sporting options for those who despair of Aberdeen FC, such as rugby or golf. As an added bonus, there's also real snow in the winter, the kind the Central Belt can only dream of now. For many, St Andrews is the place where Prince William went to university, where he met his girlfriend and – if you’re really on the royal ball – studied art history, and later geography. For some people, that’s a very good reason to go. For others, it’s a good reason not to. 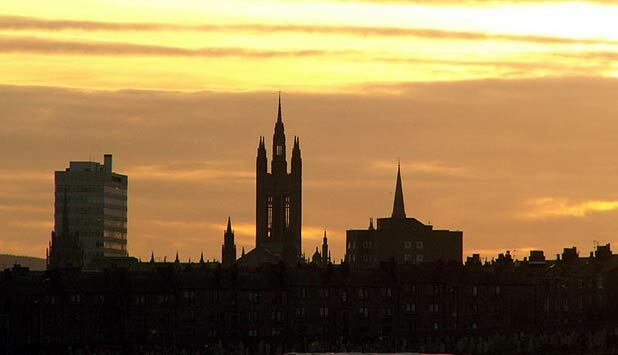 But for those who really don’t care either way, St Andrews offers so much more. The streets are paved with history – literally. The town centre’s layout remains as it was in the Middle Ages, when St Andrews was a thriving market town doing trade all over Scotland. The Cathedral housing the remains of Scotland’s patron saint didn’t exactly do the town’s reputation any harm either, as pilgrims flooded its corner of Fife. For centuries, St Andrews proudly held the title of ecclesiastical capital of Scotland, and wielded immense influence in Europe. But despite these austere beginnings and genteel appearance, St Andrews has always been a place of quiet rebellion. The students at the prestigious University of St Andrews manage to create their own diverse community – a definite plus in such a small town – which meshes well with the locals. These are not the kids you would expect. To look at it, you wouldn't guess that somewhere as quiet as Stirling was so rich in bloody Scottish history. And yet you can't take a step out your front door without coming face to face with it. From the brand new Wallace High School to The William Wallace pub, from Wallace Street to the towering Wallace Monument, which can be seen for miles around, its obvious that Stirling is incredibly proud of its connection to the national hero. Yet despite being the site of one of Wallace’s greatest victories – and surprisingly, only made an official city in 2002, as part of the Queen's Golden Jubilee celebrations (waging from the still-shiny plaques declaring this fact, people are still pretty proud) – today Stirling is a rather peaceful place. Even in the height of summer, when tourists pour daily from the trains and buses, the city centre never seems to reach the hubbub that characterises Edinburgh and Glasgow at the same time of year. Which isn't a bad thing at all if you fancy a little change. Nearby Bridge of Allan and Dunblane are also lovely for a daytrip should you find yourself with a few hours to spare.